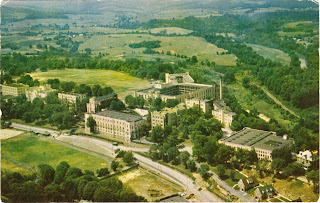 Outgoing postcard US-3372299 to Taiwan shows an aerial view of Virginia Military Institute (V.M.I), a state-supported military college in Lexington, Virginia. Allegheny Mountains in the distance, V.M.I is famous as a military and engineering school, frequently referred to as "the West Point of the South." In keeping with its founding principles as the oldest state-sponsored military institution in the United States, V.M.I enrolls only military cadets and awards 18 baccalaureate degrees exclusively in 14 majors in Applied Mathematics, Biology, Chemistry, Civil Engineering, Computer & Information Sciences, Economics & Business, Electrical & Computer Engineering, English, History, International Studies & Political Science, Mechanical Engineering, Modern Languages & Cultures, Physics, and Psychology. V.M.I offers cadets strict military discipline combined with a spartan, physically and academically demanding environment.